Sometimes I just need a few bread rolls and don’t want to bother with a large bread recipe. 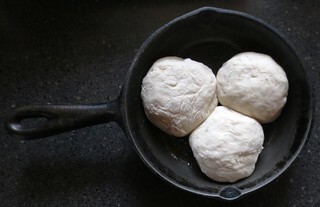 This is a small recipe for rolls baked in an 8 inch cast iron skillet. Proof yeast with 1/3 cup of warm water (115 f degrees) with yeast and 1/2 tsp of sugar. Once your yeast is proofed, add 1/2 cup of flour and remaining ingredients. Mix and add water and additional flour to make dough ball. One cup of flour makes 3 smaller rolls and 1-1/2 cups of flour makes a whole 8 inch pan of rolls as shown in top photo. 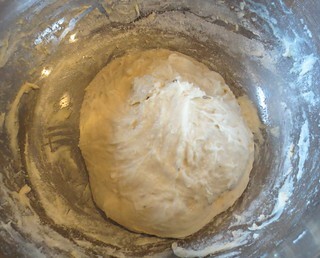 Use additional flour to knead dough ball for a minute or two. Cover and let rise until double. My dough doubled sitting next my woodstove in an hour. Punch down dough and separate into 3 rolls and place dough balls into a 8 inch cast iron skillet. If your cast iron skillet is not well seasoned, brush with oil lightly before placing rolls in pan. You can read more about caring for your cast iron pans by checking out this useful article link. Let dough rise again for about an hour or until you have a nice rise to your rolls. Below is an example of just one cup of flour used for 3 smaller rolls. These were risen and ready to bake. Brush tops of rolls with butter if desired which helps your rolls have a nice browned top. Bake at 400 f degrees for about 15 minutes or until top is lightly browned. Allow to cool for a few minutes and enjoy the tasty rolls!